It was Friday night and I felt guilty. Danny and I were leaving the kids for the third night in a row and they weren’t complaining. But I felt awful. I threw together a meal that I didn’t think much of (there was absolutely no nutritional value; pour on more guilt). As soon as I lined them up on the bar the kids all oooohed and aaaaahhhhed. What was the big deal? 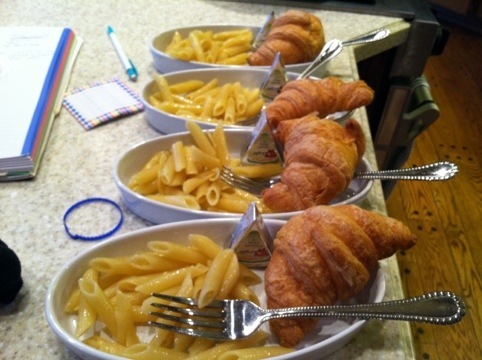 The meal consisted of buttered pasta, Laughing Cow cheese wedges, and mini croissants. Ellie said, “You should blog about this meal!”. Umm. Ok. I’m not sure why they found the meal so delightful but I thought I’d document it nonetheless. Next time I’ll add strawberries or clementines. Broccoli? Spinach? Anything to make me feel less guilty.